In the race for county attorney, Kent Volkmer (left) is well ahead of incumbent Lando Voyles, according to unofficial totals. 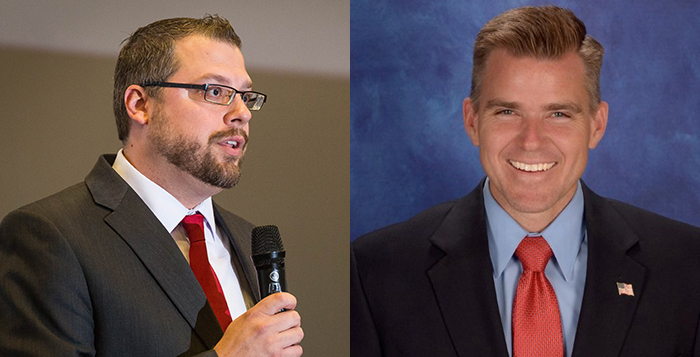 Early election results in Pinal County show a pending upset in the county attorney’s race. County Attorney Lando Voyles campaigned in tandem with sheriff’s candidate Steve Henry under the endorsement of sitting Sheriff Paul Babeu. According to preliminary results, both Voyles and Henry are losing their Republican primaries. Voyles has been outstripped by Casa Grande lawyer Kent Volkmer, who currently has 58 percent of the vote. Volkmer was endorsed by the Pinal County Deputies Association. In two candidate forums this summer, Voyles did not attend, leaving Volkmer to state his case and criticize the sitting county attorney on several points. After Tuesday’s vote, Volkmer said his substantial lead over Voyles represented the majority’s desire to hold elected officials accountable. Volkmer admits to not being a polished polititian, which could be an asset. “I think why I resonated with the people is because I am one of them,” he said. “I am not happy with the status quo. I feel some of our elected officials are letting us down. I think that I am viewed as an honest person who wants to do right by the people of this community. Former deputy Mark Lamb has even wider margin over Henry, leading with 62 percent. The winner of the GOP sheriff’s primary will likely face off with Democrat Kaye Dickson, who is leading rival Kevin Taylor by a 26-point margin. See related story. At the state level, with 90 percent of precincts reporting, Babeu leads in the Republican primary for Congressional District 1 with 33 percent of the vote. The next closest competitor is Wendy Rogers at 23 percent. On the Democrat side, Tom O’Halleran leads Miguel Olivas by 18 percentage points. In the Senate race, longtime incumbent John McCain leads next closest rival Kelli Ward by 62,000 votes and will likely be the Republican to face Democrat challenger Ann Kirkpatrick in the general election. Statewide voter turnout was 23 percent.